With customers in South Korea increasingly making the switch to imported premium cars, Hyundai has decided it’s time to deliver a luxury sedan that they hope will bring back the domestic consumer. Sources inside Hyundai say that the new vehicle may be introduced as early as later in 2014. The new project has the codename AG, with the car set to target middle-aged consumers who have a more conservative approach that does not fit with the recent youth-oriented designs Hyundai has been releasing. This move seems to show just how concerned Hyundai and Kia are about the slide being experienced in domestic sales. The sister companies sell roughly 14% of all their vehicles in the domestic market. Part of the problem is the reductions in tariffs being placed on imported vehicles, allowing the likes of Mercedes-Benz, BMW, and Volkswagen to post double-digit sales growth last year. Meanwhile, Hyundai have seen their numbers slip by 4%. 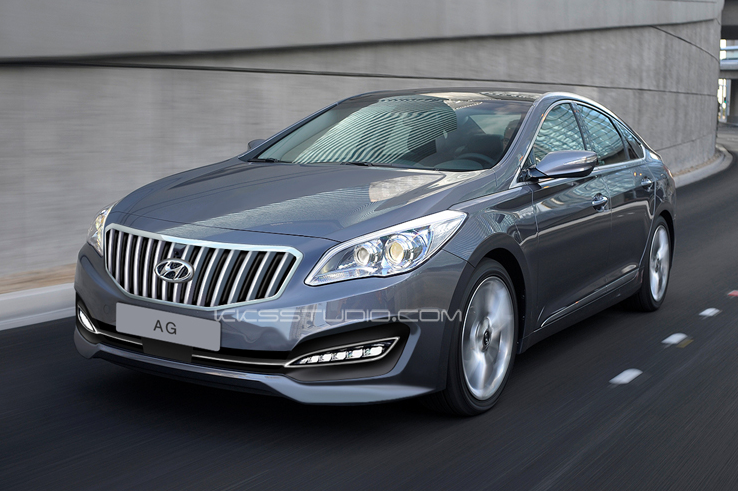 Photo Rendering Of Upcoming Hyundai AG – This is how the model may look like! Hyundai has already refreshed the Sonata midsize sedan and Genesis luxury model in an attempt to halt the slide. The midsize and larger sedan market is where the numbers really have to be made up, as those account for 60% of domestic sales. It is believed the AG will ride on the larger platform used by the Grandeur, which is known as the Azera in the US, although it is also likely to be larger. It would spear that Hyundai are looking to improve their premium image at home, as that is the segment where the imports are making the biggest impact. The AG will slot in nicely between the Grandeur and Genesis, which is an area where the damage caused by imports can be halted. The insider believes that the AG will sell for around 40 million won ($37,800), which would put it in the ball park with the Mercedes-Benz C-Class, BMW 3-Series, and the Audi A4. The spokesperson also revealed that the design of the AG would be more conservative than the Genesis, with the middle-aged being the target market. There have been rumblings of domestic discontent with the latest designs, particularly on the Grandeur, which many feel is aimed at the younger generation. Local media have gone as far as to predict that the AG will be unveiled at an auto show in Busan this coming May.